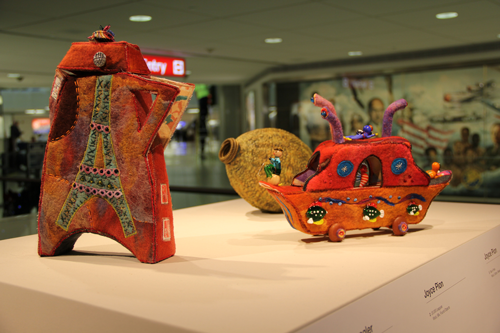 Turning what was once considered just a craft into amazing visual pieces, Missouri Fiber Artists are pushing their creativity for mainstream audiences with a new exhibition, 3D Fiber Explorations, at Lambert-St. Louis International Airport. Free and open to the public, the exhibition runs December 5, 2014 through April 4, 2015 in The Lambert Gallery in the bag claim level of Terminal 1. 3D Fiber Explorations is presented by Missouri Fiber Artists and sponsored by the Lambert Art and Culture Program and the Regional Arts Commission. The exhibit’s 23 works from local artists will prompt the visitor to pause for a moment and to see fiber work in a new light, beyond craft and into the realm of fine art. 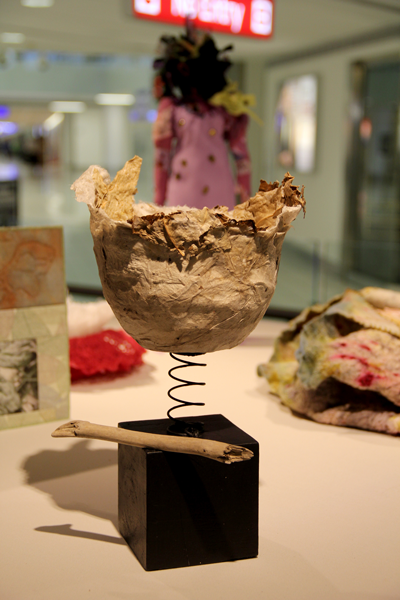 Materials for this exhibition include paper, wool, felt, linen thread, silk, cotton and other materials. The fiber art genre includes surface designers, felters, embroiderers, dyers, quilters, weavers, basket makers, paper makers and more. Through innovation and creativity, Missouri Fiber Artists also strives to place St. Louis into the realm of a lively and innovative city. Works in this exhibit are contributions to the multitude of fine art in St. Louis. Artists include Shirley Boudreaux, Kacey Cowdery, Tracy Deniszczuk, Katherine Ehlmann, Candyce Grisham, Pamela J Gruer, Laurie Harper, Joanne Kluba, Sandy Kolde, Hae-jung Larsen, Tamryn McDermott, Shirley Nachtrieb, Pat Owoc, Joyce Pion, Rhonda Schrum, Phyllis Shipman, Susan Sontag, Leandra Spangler, Janet Frazee Wade, Barbara A Zappulla. The Lambert Art and Culture Program sponsors a rotating exhibition schedule in The Lambert Gallery featuring local and regional arts organizations. Previous exhibitors include the Photography Hall of Fame & Museum, Missouri State Museum, Foundry Art Centre, Craft Alliance and the Griot Museum of Black History. A seven-member Airport Art Advisory Committee led the selection effort for the latest series of exhibitions at the Lambert Gallery. Members are David Allen, Director of Metro Arts in Transit; Susan Marie Barrett, Director of the World Chess Hall of Fame; Laura Helling, Director of Development for Wings of Hope; Marilu Knode, Director of Laumeier Sculpture Park; Jill McGuire, Executive Director for the St. Louis Regional Arts Commission; Kiku Obata, Founding Principal of Kiku Obata & Co.; and Freida L. Wheaton, Salon 53 and Founder of Alliance of Black Art Galleries.